Ford plans to form a joint venture with Anhui Zoyte Automobile to create a new brand that will design, build and sell all-electric cars in China. US automaker Ford (NYSE:F) is set to fully launch electric cars for the Chinese market as it fights for a place in the surging electric vehicle (EV) market. The company has agreed to form a joint venture with China’s Anhui Zoyte Automobile (SZSE:000980) to create a new brand that will design, build and sell all-electric cars in the Asian country, Ford said in a statement on Tuesday (August 22). “The potential to launch a new line of all-electric vehicles in the world’s largest auto market is an exciting next step for Ford in China,” said Peter Fleet, Ford’s president for the Asia Pacific region. China is the world’s fastest-growing market for alternatively fueled vehicles, and Ford predicts demand in the country will hit 6 million units a year by 2025. The potential joint venture with Anhui Zotye, a leader in Chinese electric car market, would represent a deepened commitment to EVs in China. The company sold 16,000 EVs from January to July of this year, which represents year-on-year growth of 56 percent. “This presents us with an exciting opportunity to leverage each other’s strengths in achieving a win-win situation for both parties’ growth in the fast-evolving Chinese electric vehicle market,” commented Jin ZheYong, Anhui Zotye chairman and president. Ford is trying to catch up with its rivals in the EV space, such as Volkswagen (FWB:VOW), Volvo (STO:VOLV) and BMW (ETR:BMW). Those companies are on track to electrify all their models by the end of the decade. The announcement from Ford is another good sign for lithium, a key metal in the batteries used to power EVs. The battery in a Model S from Tesla (NASDAQ:TSLA) uses about 45 kilograms of lithium carbonate. Considering increasing demand for electric cars, research firm Roskill estimates that 785,000 tonnes of lithium carbonate equivalent a year will be needed by 2025, amounting to a 26,000-tonne shortfall from anticipated supply. That’s compared to 217,000 tonnes of demand vs. 227,000 tonnes of supply this year. Many market participants question whether lithium producers will be able to keep up with this soaring demand. That’s because while there’s plenty of lithium in the Earth’s crust, extracting the mineral is not always easy. Bringing projects online can take years, as processing battery-grade lithium can take anywhere from three years to seven years or more, depending on the project. 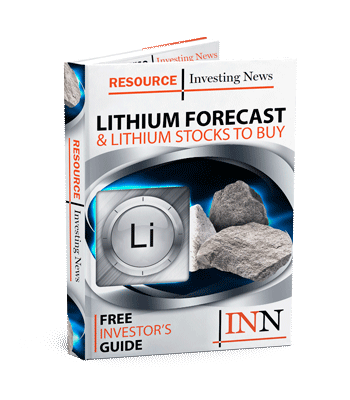 Lithium prices have been surging for the past few months and will continue to rise, according to Benchmark Mineral Intelligence. The firm predicts that lithium carbonate prices will average $13,000 a ton over the 2017-to-2020 period from around $9,000 a ton in 2015 to 2016. Lithium hydroxide is expected to average $18,000 a ton between 2017 and 2020 against $14,000 from 2015 to 2016.